There are a number of options within Cradle for saving the change history on items. While it would seem logical that one would want to save all changes to all items, there are a number of scenarios where this may not be the case. Cradle allows control of these options through Project Setup in WorkBench under the Item Definitions Option on the Item Types tab. 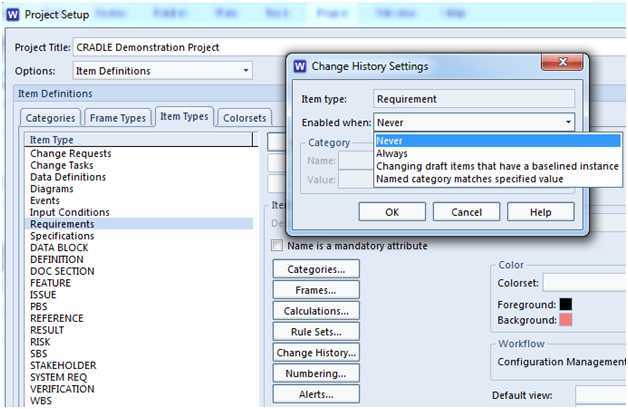 Each item type can have its own Change History setting, providing for flexibility in how you manage your data. Highlight an item type in the left hand column and click the Change History button. This brings up the Change History Settings dialog. 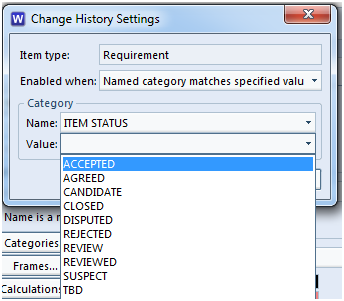 The options for Change History are: Never, Always, Changing draft items that have a baselined instance and Named category matches specified value. While Never does not seem like a good engineering option but there are cases where it serves a project well. DOC SECTION items may contain generic text used in general documentation. The primary value of the item type is for the links and traceability to produced documents. Keeping track of the changes to the text may not be necessary for engineering. This will likely be your least used option. Always tracks every change to every item of that type. The good thing is you have all the changes. The bad thing is if there is a lot of volatility in your project you can collect a large volume of changes to store and sort through to find meaningful changes. Changing draft items that have a baselined instance; this option allows you to get a project started, import initial data and reach a point where your data is ready for its first baseline. All of the changes in this initial step represent the typical flux of a new project. The option is best used when you know the project data will settle down once the initial data entry is complete. After the data is baselined, all of your future drafts changes will be recorded. Named category matches specified value sits between Always and the baselined instance options. There is still the need to enter a volume of new data and make a considerable number of changes before data is clean enough to track the history but you do not want to start the baseline process without some idea of an item’s history. Item categories can be useful to define when an item is ready to be tracked. As an item owner, you can set a status category which indicates to the project that the item is stable enough to start tracking the changes. This will allow for those in the approval process for the initial baseline to see relevant change history but not require every change and spelling correction from the initial entry of the item. One process note, if you change the category for that item the history is no longer tracked. For instance, if your schema indicates that the Item Status of Accepted is used to start tracking history and the Item Status is later changed to Disputed, history is no longer tracked for this item until such time as the Item Status is reverted to Accepted.